I make my husband German Chocolate Cake every year for his birthday. It was his favorite growing up and his grandmother still bakes him a German Chocolate Cake whenever we go to visit. This year I made a cupcake version. Researching for the recipe, I looked closely at the Better Homes & Garden version and the Magnolia version. The ingredients were almost identical and the proportions very similar (the BH&G recipe had slightly more chocolate and slightly less butter). The main difference between the recipes, however, was the number of steps involved. The BH&G recipe had 5 simple steps. The Magnolia recipe had 10 relatively simple steps, but it also had the unfortunate requirement of my having to wash out my one Kitchen Aid bowl in between two steps. I fully intended to do both versions, half recipes of each, and do a side by side comparison of the two. I wanted to know if twice the number of steps made a difference. I am sad to say that I didn’t manage this side-by-side comparison, we got home much too late from birthday present shopping. For the sake of time, I ended up whipping out the BH&G version and added milk chocolate glaze. in a small saucepan, melt chocolate and water over low heat. remove from heat and let cool. Maybe a ganache o’er top of a pile of filling… hmmm. hmmmm. what’s the magnolia version? maybe i could try and lt you know if it’s any better? Hello! I love your gorgeous photos! Can I ask what camera you use? disappointing resaults in special occasion…. i guess it was imparessing. Did your huspend like it? although it was a delicious photo. good luck with future recipes. I came here through slashfood – this looks AMAZING. It’s strange that slashfood blew up your photo 800% – cos it sort of looks washed out and pixely on their site, but good on yours. rosebengal, I will have to try that one. thanks! kris, I have the Canon EOS Digital Rebel XT digital SLR. Its sweet. 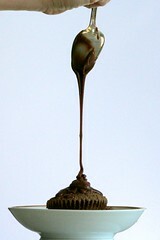 1. in a small saucepan, melt chocolate and water over low heat. remove from heat and let cool 10 mins. I’ve just found your blog via Heidi’s 101 cookbooks and i’m already addict. You’re pictures are great and your cupcakes mouth watering. Oh, so good. That last photo is enough to make anyone hungry. I just found your site from a Google search for Vietnamese Baked coconut pudding…. Awesome! I, too, make German Chocolate cake each year and the best recipe I have found (and now you annually) came from Cooks Illustrated. For the filling: Whisk yolks in med. saucepan, gradually whisk in evap. milk. Add sugars, butter & salt. Cook over med. high heat whisking constantly until boiling, frothy and slightly thickened. Transfer to a bowl, whisk in vanilla. Stir in coconut. Cool until just warm then cover with plastic wrap and refridgerate until cold, at least 2hrs but up to 3 days. Pecans are stirred in just before cake assembly so they do not get soggy. FOR THE CAKE: Preheat oven to 350*. Grease & flour 2 – 9″ round pans. combine chocolate & cocoa in sm. bowl. Add boiling water and let stand 2 mins. whisk until smooth and let cool to room temp. Sift flour & baking soda into med. bowl. Beat butter, sugars & salt until light & fluffy (about 4mins). Scraping down bowl 1/2 way through. Beat in eggs one at a time combining well after each. Beat in vanilla, then beat on high 45sec until light and fluffy. With beater running add in chocolate, beat 30 more sec. Batter may appear broken. On low speed add dry ingredients in 3 additions, alternating with the sour cream, beating until barely combined. After final addition of flour stir with spatula. Batter will be thick. Bake about 30mins until tookpick inserted near center comes out clean. Cool in pans 10mins on wire rack. Turn out of pans and cool completely before filling! Note – i meant to say, now USE annually…. it really is a FAB german choc cake, even though it sounds labor intensive. I will try it this year for sure. Thanks! Yum! I had a bit of a fail when making your topping – user error, entirely, which usually happens when you’re trying something at the last minute for a next day event. Anyway, I improvised and it still turned out really well. Thanks for the inspiration! I grew up watching my grandmothers and mom make German Chocolate Cakes. There was always a German Chocolate Cake for Christmas. They used the recipe on the German’s Chocolate wrapper. When I started baking I used the recipe on the wrapper. One year my cake was a total disappointment. I called my mom immediately to get her advice on what had happened. We finally compared a new label with an old copy my mom had kept in her recipe file. The difference was beating the egg whites separately and folding them into the batter. Beating the egg whites and folding them into the batter makes all the difference. 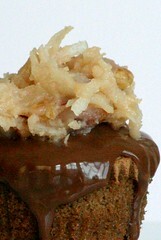 I won’t make German Chocolate Cake any other way.